The weather was perfect, cloudy and mild with just a hint of breeze. Luckily we had almost finished packing up at about 2am before the rain started. We set up 2 traps from the mains and a further 3 traps about 200 metres along the canal/watercress beds. Two of the traps were placed right next to large outcrops of Butterbur, in the vain attempt to see whether we could get a Butterbur Moth....that never happened! Although we did get a few interesting species at the end of the night. 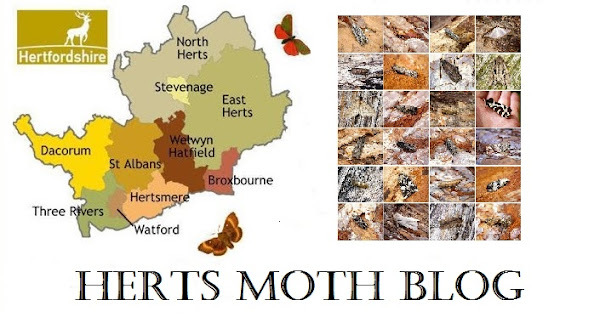 Interestingly all my previous records are from Essex, so this is my first Hertfordshire specimen. Other moths of note were a Dioryctria, possbly abietella due to its plainess and size (I have set the specimen for further identification), Ypsolopha sequella which I haven't seen for awhile now, and a possible Elachista gleichenella, which to my knowledge is extinct in Herts now. I unfortunately let it go after a few photos which I am kicking myself for doing. It does look spot on for this species and has many more markings than atricomella, alpinella and the rest of the confusion species.